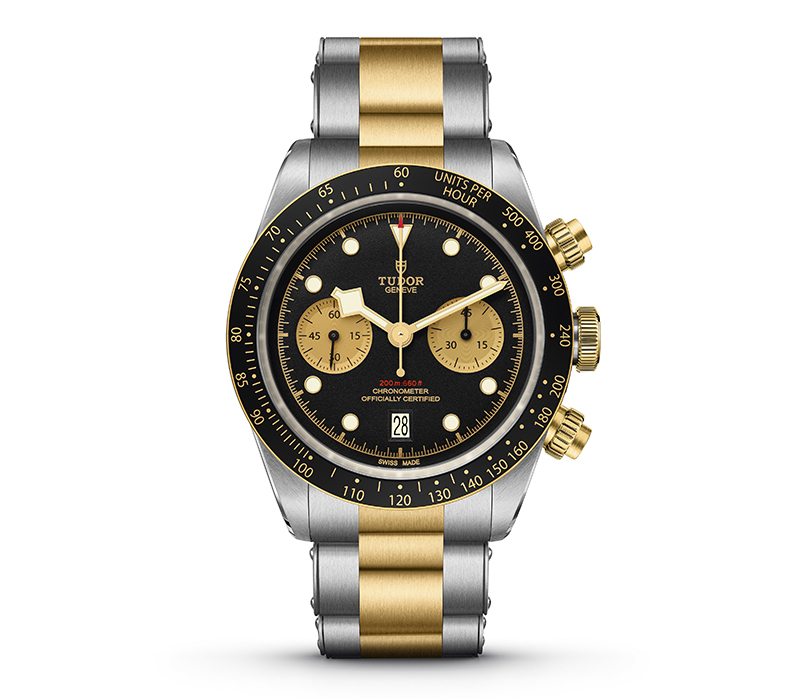 THE irony is thick: It took a collection — the Heritage Black Bay pieces — which brought together the nicest touches found on Tudor’s (and even Rolex’s) various dive watches from the mid- to late-20th century to bring Tudor to heights it never reached before (or, not in a long while, at least). After years of groping around seeking a defined audience for its products, the watchmaker regained its cred, if not built a new following, with the release of pieces that hark to the brand’s best hits. It was actually the Heritage Chrono of 2010 which started the ball rolling for Tudor. A modern reinterpretation of the brand’s Oysterdate Chronograph built between 1970 and1977 (references 7031, 7032, 7149, 7159 and 7169), the Heritage Chrono instantly drew favorable response from a market which, until then, was willing — or forced — to shell out a sizeable sum for an Oysterdate Chronograph. With the Heritage Chrono, what this market received was an attractive, well-executed piece that came about as a result of modern watch-making processes. That its movement, an ETA 2892-A2 tweaked by Tudor and which received a chronograph add-on, may not have the romantic allure of the vintage models’ Valjoux movements did not diminish the Heritage Chrono’s luster one bit. Especially when Tudor updated the watch in 2013 with a Monte Carlo attire (called the Heritage Chrono Blue). 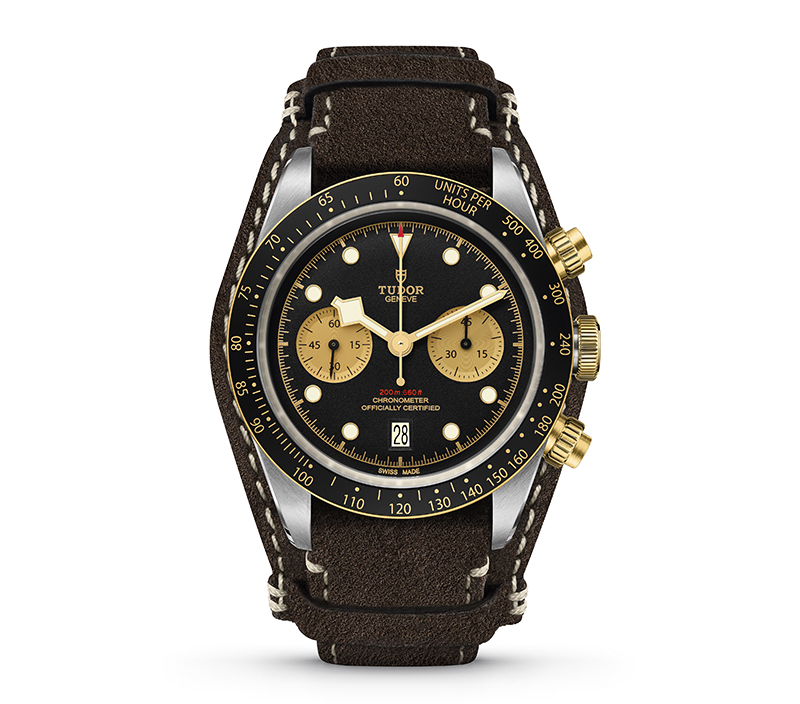 But a year before the Monte Carlo’s debut Tudor had brought out the first Heritage Black Bay, completing the brand’s series of nostalgia pieces (Tudor in 2011 also released the Heritage Advisor, a modern reinterpretation of its alarm watch from 1957). The Black Bay was an instant classic. And Tudor never let up since, continuously introducing the collection in new colorways, sizes and material, as well as eventually fitting it with in-house movements. A couple of these even packed complications; the Black Bay debuted a GMT version (in Baselworld 2018) and a Chrono (a year prior). At this year’s Baselworld, the Black Bay Chrono returned to the spotlight wearing something significantly more theatrical — a steel and gold attire. As a result of this wardrobe change, the new model is now called the Black Bay Chrono S&G (yup, meaning Steel & Gold). This new model adopts the nomenclature of the three-hand, time-only Black Bay S&G that came out alongside the original Chrono in 2017. Discarding the Chrono’s monochromatic silver-and-black outfit totally lent the Black Bay Chrono S&G a sophisticated, dressier attitude — it’s more black tie than black Yeezy Boost. The watch’s black bezel (fixed, with a tachymeter scale) with gold numerals and markings is detailed by a thin gold strip on its base. The now-familiar matte black dial now sees its pair of sub-registers (45-minute counter at 3 o’clock, small seconds at 9 o’clock) in gold, adding a layer of contrast to the landscape. The slightly off-white round hour markers (and iconic triangle at 12 o’clock) and snowflake hands are all gilt-ringed/tipped, tying them in with the color scheme. Minute and second markers also come in gold. Providing extra interest is the tiniest dose of red, found on the tip of the central chronograph hand and the inscription for water-resistance rating (200 meters). A date window resides at 6 o’clock, staying faithful to Tudor chronograph tradition. Complementing the bezel and dial furniture are the gold crown and pair of chronograph pushers. Tudor really dug into the details in this watch. The steel part in the S&G is supplied chiefly by the 41-millimeter case and, if opted for, the bracelet — which, in turn, also flaunts center links in gold. The Chrono S&G’s dressy mien turns slightly outdoorsy if the watch is paired with a brown leather strap that can sit on top of a bund, or a black fabric strap. But, whichever wrist attachment is picked, the timepiece retains the period vibe on which the Black Bay has propped its appeal. Oh, and what appeal the Black Bay Chrono S&G has on the wrist (or even when merely held in hand, as well as when it’s sitting on a desk inside Tudor’s presentation room in Baselworld as it basks in the glory of quick snaps). For starters, it feels hefty without being cumbersome, a result of the watch’s ability to drape on the wrist rather than sit on top of it. And while its color contrast is quite bold, it also manages to bring out details — the different knurling applied to the crown and pushers, recessed subdial, crisp printing of the tachymeter markers — which needed closer inspection in the all-steel Chrono. What is retained from the Chrono is its significant bit, the self-winding cal. MT5813. Tudor’s first in-house chronograph movement was a complete surprise when it came out in 2017 principally because Tudor and Breitling managed to keep their collaboration under wraps — the MT5813 was spun off Breitling’s seminal B01 movement. 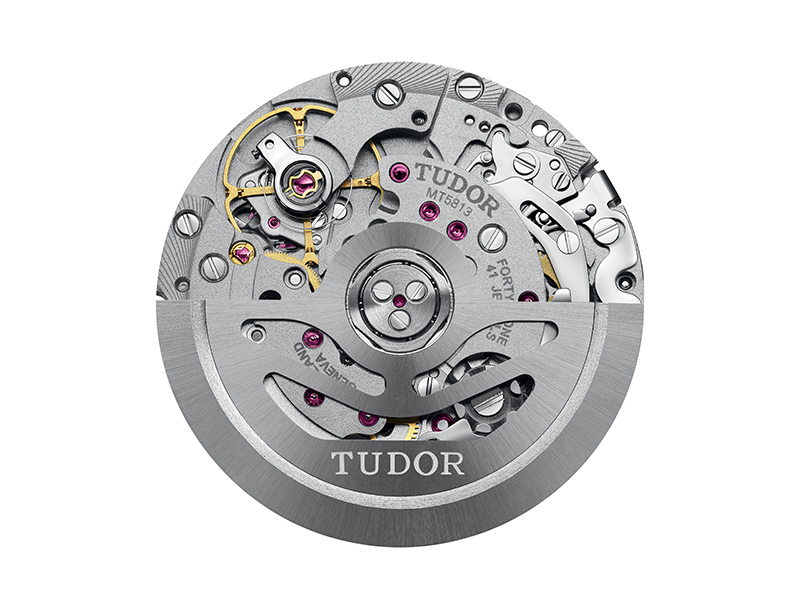 This means Tudor’s ticker is a properly tooled chronograph with a column wheel and a vertical clutch, promising smooth engagements and no jerking second hand every time the pusher is pressed. 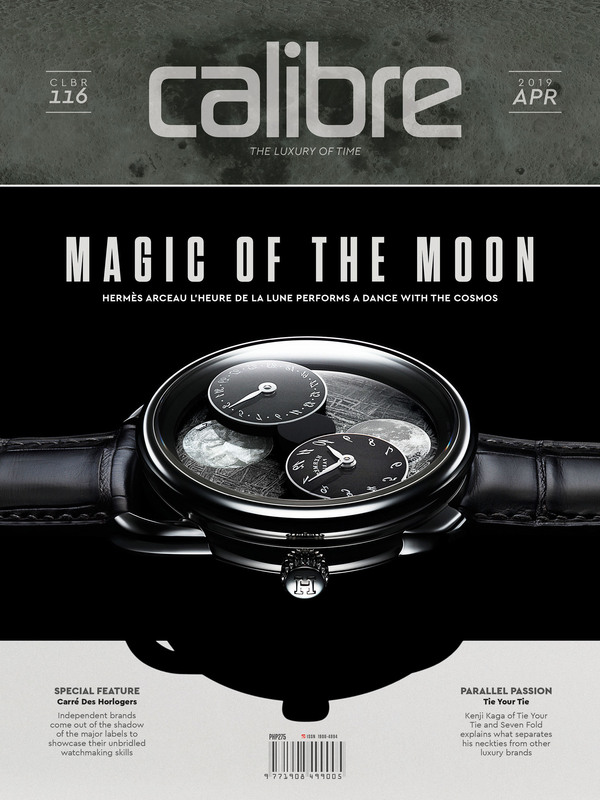 Plus, the cal MT5813 betters the B01 by boasting a variable inertia balance, which can keep its oscillating rate more precisely over time; a silicon balance, which resists magnetism to a much higher degree; and a 45-minute counter (the B01 is a 30-minute affair). Spinning at 28,800vph, the MT5813 has a power reserve of 70 hours, and is COSC-certified to boot. So, what the Black Bay Chrono S&G merges are the worlds of dive watches and chronographs; this piece brings together tenths-of-a-second timekeeping and underwater prowess in one tidy package. This, however, is a reflexive insight. Because the watch also injects elegance into utility, finesse into outright functionality. 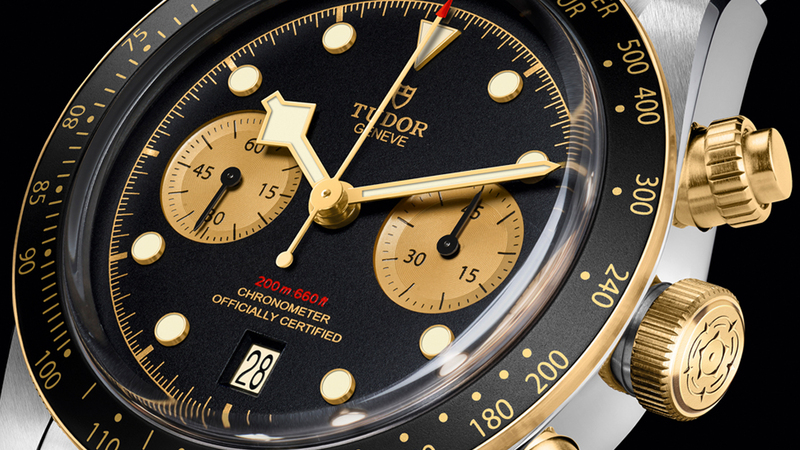 Best, what the Black Bay Chrono S&G straddles is Tudor’s storied past and bright future.